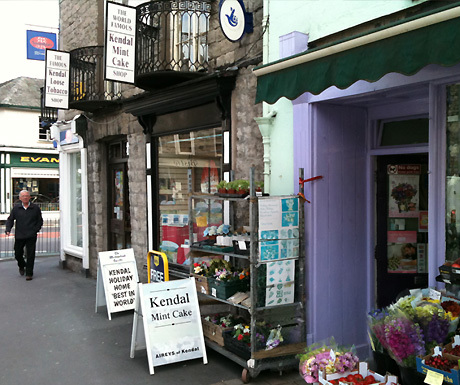 We were met with a lovely surprise when we wandered into Kendal this morning. 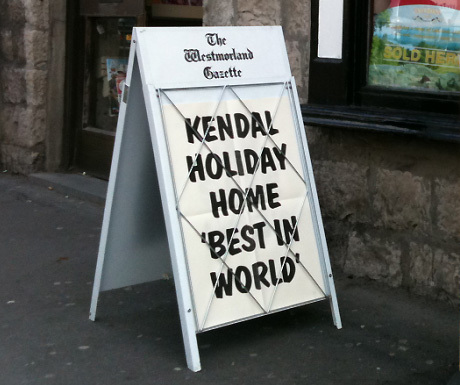 We are mentioned on the front page of this week’s Westmorland Gazette, our local newspaper, with a more detailed article and photographs inside. 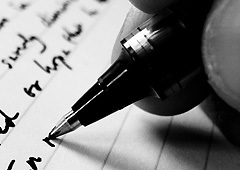 The story relates to us recently being announced as the overall winner of Holiday Lettings’ 2011 Hall of Fame. You’d be forgiven for thinking this area had had its fair share of the limelight in recent months. Another successful series of ‘The Lakes’, the new ‘The Dales’ series and the short comedy series ‘The Trip’ have all helped to put the region on the map. The BBC even staged the Radio 1 Big Weekend in Carlisle only last weekend. And the good news is that it doesn’t stop there! The BBC has just announced that it is adapting the children’s classic Swallows and Amazons for our television screens. The stories, the first of which was published in 1930, are true classics that document the adventures of young children holidaying in the Lake District and, more specifically, on nearby Windermere. Holiday Lettings’ Hall of Fame – overall winner! This is ‘hot off the press’ having arrived in our inbox only an hour or so ago. 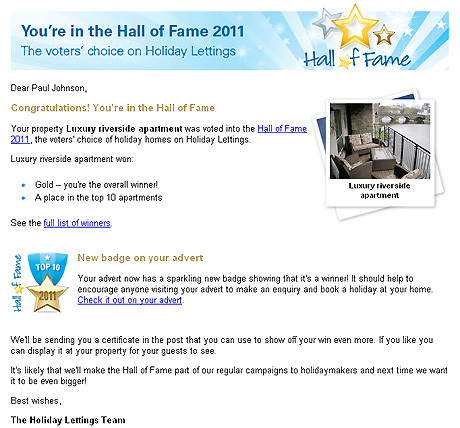 We’d like to thank everyone who voted for us in the Holiday Lettings Hall of Fame. For those that don’t know, Holiday Lettings (which is owned by TripAdvisor®) is one of the biggest self-catering portals out there, with more than 45,000 holiday homes in 116 countries. We are utterly shocked – but pleased – to have come out as the overall winners.